A couple of Saturdays ago I had the pleasure of meeting some fellow bloggers in Jaen city. Jaen province is where I've lived for over 20 years but it was the first time I'd ever stayed in Jaen city. Beginning with lunch in a great restaurant in the old part of the city near the incredible, huge cathedral we sampled some traditional dishes. 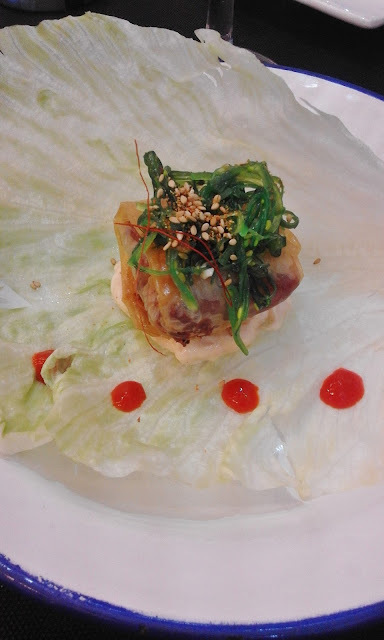 A new one to me was Violetas a crispy little package of filo pastry filled with minced beef, I'll be taking hubby to Restaurant La Espuela and having those and their great Salmorejo again. We then left the city and headed about 45 minutes north almost to the border of Andalucia at Despeñaperros the rugged mountain range and natural pass to Castilla-La Mancha. A site which over the course of history has seen many wars, we learnt about the history of the area in the Museum Batalla de las Navas de Tolosa and the bloody battle in 1212 that is commemorated with a live re-enaction every year. The ultra-modern building, I thought out of place but apparently its design is based on a castle complete with a tower giving fabulous 'lookout' views, is sited on the battleground of The Battle of Navas de Tolosa. This bloody battle was between Christian troops led by King Alfonso VIII of Castille and the Almohad fighters of the Caliph al-Nasir. The territory was retaken by the Catholic Kings which was a great foothold into the south of Spain and the eventual reconquest of Spain when The Alhambra in Granada, the last stronghold of the Moors, was taken in 1492. Then heading south again to the lovely town of Baños de la Encina and to one of the most unusual-shaped castles on the Route of Castles and Battles - Castillo de Burgalimar also known as Castillo de Bury al Hamman . 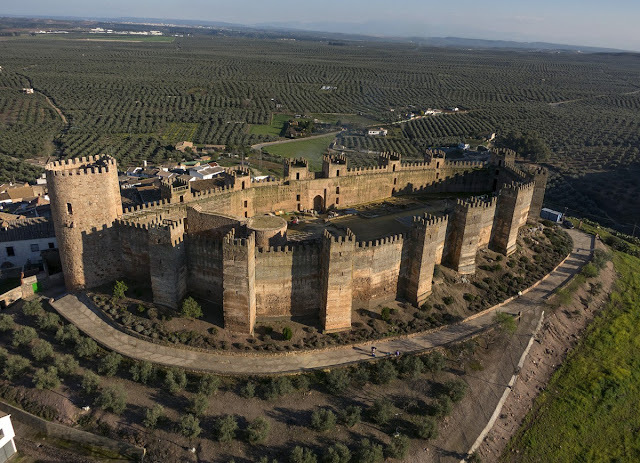 This enormous oval-shaped castle is one of the best preserved castles in Andalucia and one of the stars of the route. Returning to Jaen city, which we could see from the castle tower, surrounded by olive groves, it was time to eat again. This time in the modern and lively, down town part of the city at the very good Restaurante Dixtinto. Part of the Olive Oil Tour iniciative Dixtinto not only displays and sells excellent local olive oils but uses them as a base for many of the superb dishes we tried. 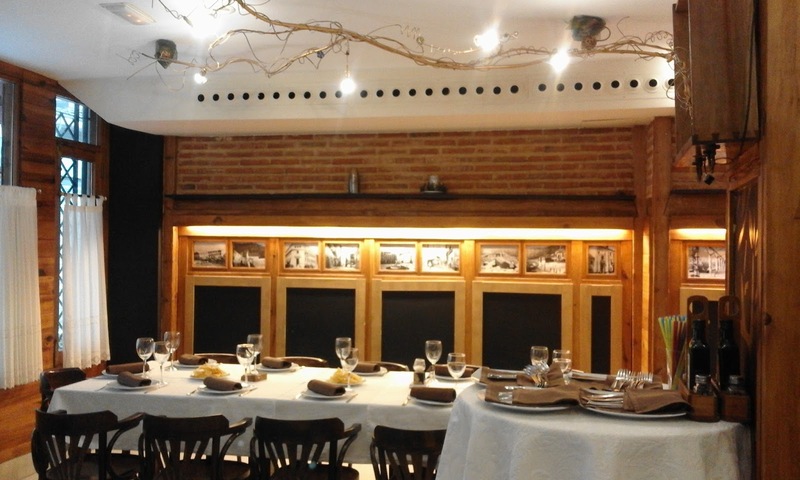 If you go to Jaen, this restaurant is one of the best in town. I'd be happy to join you there. We walked ( and needed to) back to the rather dated Hotel Condestable Iranzo, a good base between the old part of the city and the new and it has parking. Early next morning we were on the way to Alcala la Real and Fortress La Mota for a balloon flight over the province, unfortunately the wind got up and the balloon didn't! So I had the opportunity to see the fortress again, each time I've been I learn something new and enjoy the experience. Now I want to do the whole castle route. Do you? All photos are mine except the aerial view of Castillo de Burgalimar which is from the Castles & Battlegrounds Route - Ruta de Castillos y Batallas website. Read my previous posts about visiting the fortress.